The Georgian luger killed in a training accident in Vancouver phoned his father before the Games to say the layout of the track frightened him. Nodar Kumaritashvili, 21, died last Friday when his sled flipped and he left the track, hitting a steel pole at the Whistler Sliding Centre. His father David told the BBC's Tom Esslemont: "I spoke to Nodar when he was training before the Games began. "He told me he was afraid about one of the curves of the track in Canada." The father is an experienced luger himself and he told his son to use his legs to slow himself down at the part of the run that concerned him. "But I never ever thought that his taking part would lead to his death. But unfortunately it was the end. There were metal pillars after the bend and that was where he crashed. "If those pillars had not been there this would not have happened. I might have seen him again alive." 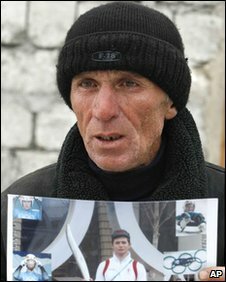 He revealed that Georgian president Mikheil Saakashvili phoned him in tears to say that the country had lost a hero. "I am not blaming anyone. But the 15th and 16th curves were designed in such a way that was too tight. When Nodar rushed around the corner at 145kph (90mph) he lost his balance," added Mr Kumaritashvili. "I am not going to sue anyone. My son proved that he is a strong sportsman. And he proved it to the whole world. God will decide who is to blame. "I am surprised that they continued with the luge event, because of what happened and because sportsmen who are more experienced and stronger than Nodar pulled out." After the accident, organisers allowed the event to proceed after making safety changes but Kumaritashvili's Georgian team-mate Levan Gureshidze withdrew from the Games.